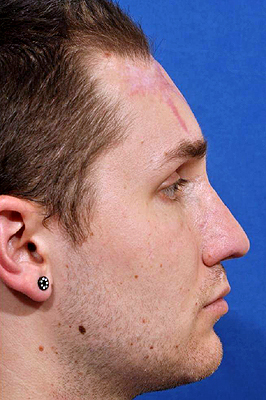 This young man’s nose was severely injured in a traumatic accident. All layers of the tip and right ala were amputated. Replantation was unsuccessful. 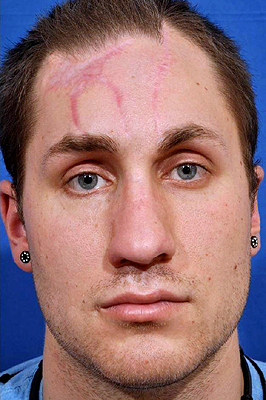 A forehead flap repair (performed elsewhere) failed and severely scarred the right forehead. 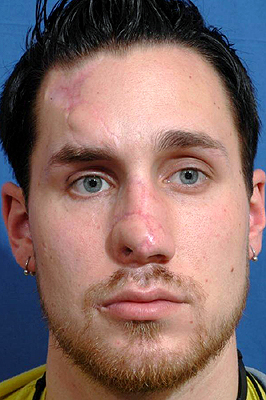 The nose remains severely distorted and the airway is completely obstructed. The reconstruction must be completely redone. A second flap was harvested from the left forehead and folded for cover and lining in 3 stages, using techniques developed by Dr. Menick. Septal and ear cartilage grafts provided a support framework. Overall nasal form and function were restored. The new left forehead scar is minimal. 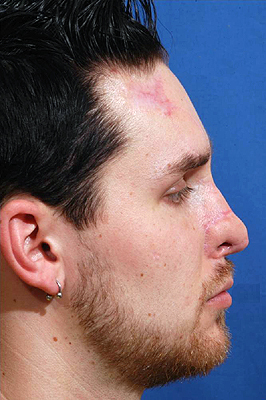 The old right forehead scar (from the initial failed repair) will be revised in the future.